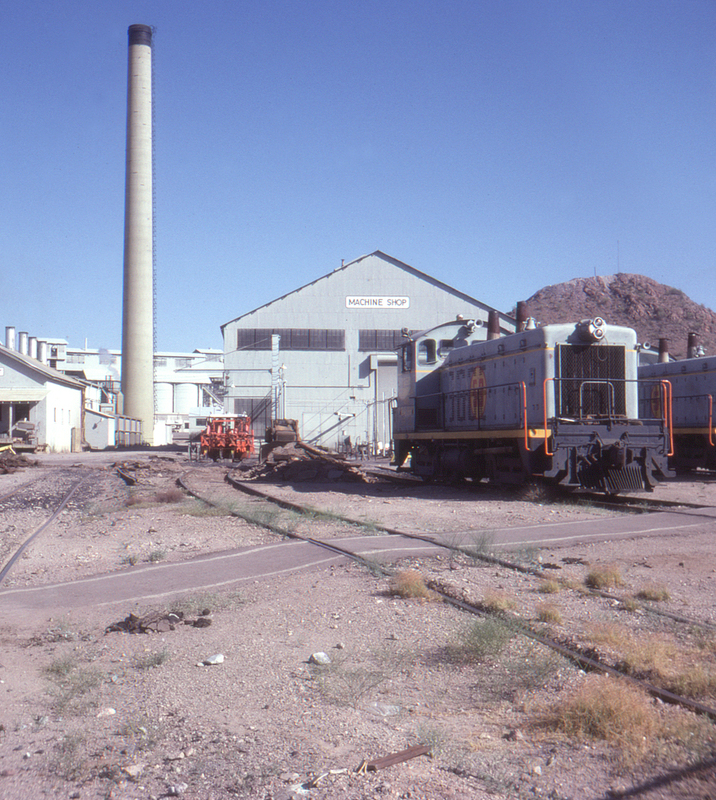 Originally begun in 1915 as the Cornelia and Gila Bend Railroad and opened a year later, this railroad had one prime purpose: to haul copper ore from the New Cornelia Mine to the Southern Pacific at Gila Bend (also known as just Gila). "Tucson" was later added to the road's name as a result of a rate dispute with the Southern Pacific, to bolster a threat to extend the line to that city (surveys were even made but the matter was dropped after SP made satisfactory rate concessions). On another occasion the road threatened to build south to a planned dock at Puerto Peñasco, Mexico but again SP made concessions and the plan was abandoned. In 1921 the mine and railroad were purchased by Phelps Dodge, the country's largest copper mining company. Gibson, Arizona (just north of Ajo) was the location of the road's machine shop and other facilities, seen here through the inevitable chain link fence.